‘Haircuts by Children’. Would you let a 9 year old cut your hair? Would you let a 9 year old cut your hair? Or, would you rather trust the fingers of John Peers at John Peers’s Hair Studio in Rochdale? On a recent edition of ‘Mary Queen of Shops’ (BBC2), Mary boldly challenged his cutting skills in front of top London hairdresser, Trevor Sorbie, to see where he was going wrong. A brave but misguided girl with waist-length hair entered the salon wanting to look like Cheryl Cole. Unfortunately, she left almost in tears, with a hair style more like Coronation Street’s transsexual, Hayley Cropper. With this in mind, we’re opting for the 9 year old, right? 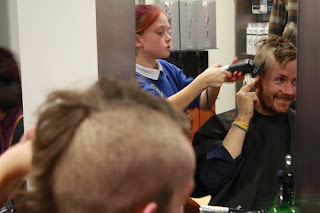 ‘Haircuts By Children’, is an arts piece produced by the fantastically named Mammalian Diving Reflex arts company where children aged 9 and under, who’ve been trained by professionals, will cut the hair of adults at a Hoxton salon this Saturday, 10th July and next Sunday, 18th July. Children from Canning Town and Newham are working with the arts company and London hairstylist and visual artist, Faisal Abdu’A llah, to develop their hairdressing skills. At London International Festival of Theatre 2010 they will be ready to offer free haircuts for the public at an East London based salon (Kaizo, 67-68 Charlotte Road, London EC2A 3PE) from 10am to 2pm. Haircuts by Children playfully is said to engage with ‘the empowerment of children, with trust in the younger generation and with the thrills and chills of vanity’. Or, hair volunteers could just like to live dangerously and like free stuff. Think I’ll stick to Nicky Clarke’s Mayfair hub. Well, would you let a nine year old cut your hair? Please leave me a comment in the box below or in the ‘shout mix’ box opposite on the right. It’s easy to do. If you like the Katie Chutzpah blog, please vote for it under ‘lifestyle’ by clicking on the black and pink Cosmo Blog Awards logo at the top of the page. Thanks. lol…I would NEVER let a child cut my hair nor John Peers!